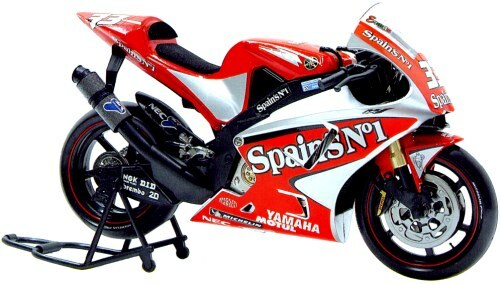 Marco Melandri Yamaha YZR M1 2004 1/10th scale model by Guiloy. This is a truly great model of Marco's 2004 Team Gauloises Fortuna Yamaha YZR M1 which he rode in the 2004 MotoGP championship. It is built in the fantastic scale of 1:10 which results in a model of some 20 cm, or 8 inches, in length. The model is made a various material such as diecast metal, plastic, sticky rubber for the tires and foam for the seat padding. The detailing is of stupendous level and you can simply sit and look at it for hours!